We are having a cold spell down here in Florida. 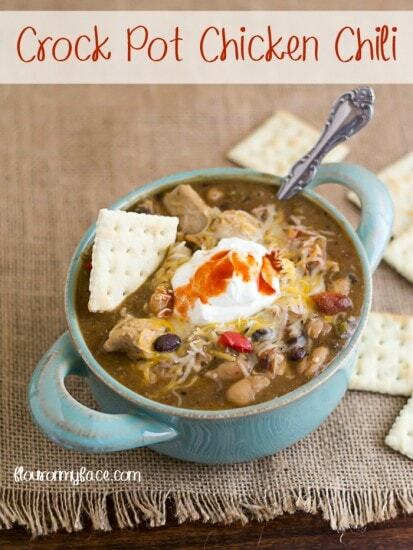 Brrrrr… Tonight is the perfect night for this Crock Pot Chicken Chili recipe. There are two meals my family loves to eat when the weather turns cold and that is a crock pot beef soup or easy Crock Pot chili. Most of the family (the guys) prefer chili made with ground beef. I, on the other hand, love Chicken Chili. Today’s Crock Pot Chicken Chili recipe for #CrockPotFriday is perfect to help warm you up in this cold winter weather. Pull out the slow cooker and make this Crock Pot Chicken Chili tonight! Heat the olive oil in a skillet and saute the chicken for about 5 minutes. Add the onion, green peppers and garlic to the skillet. Toss well and saute for 1-2 minutes. Pour the contents of the skillet into a 6-quart crock pot. Add the next 10 ingredients to the crock pot. Cook for 4 hours on high. After 3 hours of cooking mix the cool water with the cornstarch and add to the crock pot. Stir, recover the slow cooker and cook for the remaining hour or until the chicken is cooked through. Serve over a bed of rice. Top with shredded cheese and sour cream if desired. 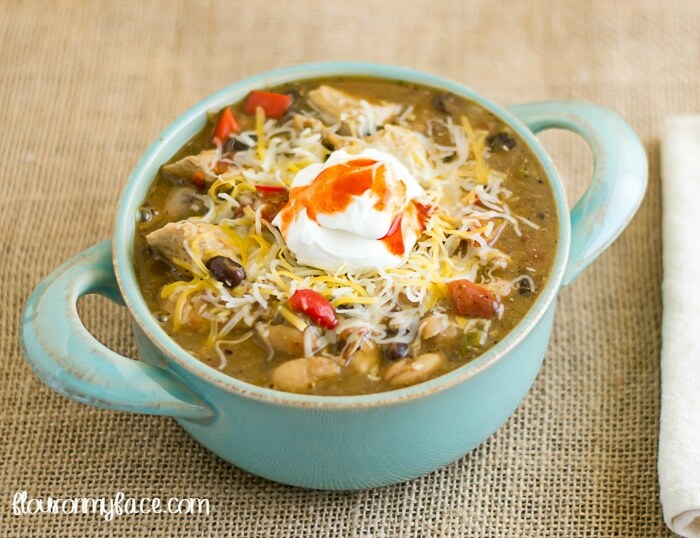 Looking for more Crock Pot recipes like this Crock Pot Chicken Chili recipe? 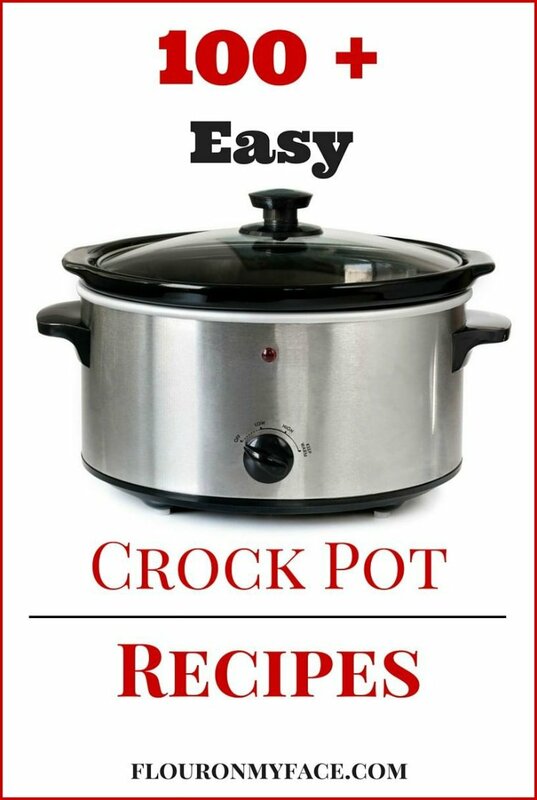 Check out my Crock Pot recipes page where you will find 100+ Crock Pot recipes. Ooh, this sounds good! Perfect for these cold months. Thanks for sharing at Merry Monday, hope to see you again next week! That bowl is so stinking cute! Thanks for sharing at the Monday Funday Link Party. Emily @ The Benson Street. This looks like one of those soups that you cuddle up with while watching a movie in the winter! This looks like such a cozy and comforting meal. I am definitely going to be making this. Just one question, I am going to be using fresh tomatoes. How do you think I should go about using them? Thank you so much! Dice the fresh tomatoes and add them to the crock pot when you add the sauteed garlic, onions and peppers.